There hasn’t been much in the way of quilty stuff on my blog lately. Probably because I’m living out at the lake right now, and no electricity equals no sewing machine. But I wouldn’t let that stop me, eh? My friend Melissa had sent me a little care package containing (among other wonderful goodies) a jelly roll of Free Spirit Pirouette a month or so ago and I couldn’t wait to cut into it. Her instructions were to experiment, play and enjoy. I took this literally and decided to do just that by learning a technique that was brand-new to me. I have always admired heritage quilts, and have always wanted to make a quilt entirely by hand. One day I saw that there was going to be Hexie-Queen Blog Hop, and since I had never made a hexie flower before, it seemed like the perfect opportunity to learn. I took the jellyroll to my LQS and paired it with soft grass-green for the flower centers and garden path, and a creamy/buttery pale gold for the background. I loved the way the prints seemed to sink down and make themselves at home in these two complementary shades. Having decided to take the plunge, I looked at a couple of tutorials and then jumped into the deep end with the decision to start a hexagon quilt. I am slowly sewing 1.5-inch hexagons all sewn together into a Grandmother’s Flower Garden pattern. By hand. I carry it back and forth to town and work on it in the car. This antique glass butter dish is the perfect little container. This entry was posted in Beauty, Colours, Creativity, fabric, Fox Lake, furry helpers, Play, Quilting, Quilts, Stitches, Summer and tagged blocks, blog hop, cabin, creativity, fabric, Fox Lake, hexagon quilt, hexi flower, hexie flower, jelly roll, quilt, quilting, stitches, work in progress. Bookmark the permalink. I am also working on my first hexie project–a Christmas table runner. My daughter, Abby, recently asked me to consider putting together 5 quilts (we have 5 children, all married) as special Christmas gifts. Her idea is to display them unwrapped for our Christmas celebration, then have each family pull a number from a hat. The family who got #1 then gets to choose from the displayed quillwork, down the line until each project has found a new Christmas home. At first, I balked. When I make quilts for the family, I try very hard to customize it for the intended recipient. This year, though, has found me recuperating from several surgeries, so somehow Abby’s idea has become more intriguing. So far, I am 3/4th’s done with the hexie runner and ready to quilt a table topper constructed around an antique Christmas handkerchief. If you’d be interested, I’d love to share my hexie work if and when it reaches completion. Thanks so much for sharing your work–beautiful! How do you finish the back? Very pretty. I love the color choices. I too have been working on a Grandmother’s Flower Garden quilt sewn completely by hand. I agree that hand sewing the small pieces is very relaxing. I also love the fact that it is so portable. I keep a zipper pouch in my purse with the pieces so I have it where ever I go. Best wishes. This is going to be a beautiful quilt – and it will come with such a huge sense of accomplishment! I am so jealous. I want to make one just like yours. It is so soft and pretty. You have done a wonderful job! I also admire your chair sitting out on the dock!! What a beauty it is turning out to be. Love the fabrics you have chosen. I love it! I am also in the middle of a long-term hexagon quilt project for my king bed so yes we don’t rush these things. Thank you for sharing. Absolutely gorgeous!! I love the fabrics and the colors. Outstanding! Sadly, none of your pictures are showing on my computer but from the comments your project must be very pretty. Beautiful! Cheering you on with this gorgeous handstitching project. I think it is going to be beautiful too. I hope you continue to enjoy the relaxation of hand piecing and the beauty of your creation. I agree, your quilt is going to be beautiful! Thank you for sharing! Ha HA. I must be half blind it took me forever to find where to post a comment. I want to say how beautiful you quilt is going to be. You have a lovely setting in the background. Thanks for sharing. Wow! And all by hand. I hope you post a photo when you are all done. The colors are lovely and you should be so proud of what you are accomplishing! Keep up the great work! Thanks for sharing. Beautiful hexies. Love the colors that you chose. Beautiful cat and beautiful quilt. Wonderfully done and as a first time hexie maker. What you’ve completed so far is beautiful. It’s going to be a stunning quilt when completed. Very pretty hexies. I love the gentle colors you choose. What could be better than doing hand work by the lake. Beautiful. what a wonderful start. great color choices. enjoy the process. You picked very, very pretty colors to compliment your jelly roll. You did an amazing job of picking the fabrics. You are doing an absolutely fabulous job of making your quilt. 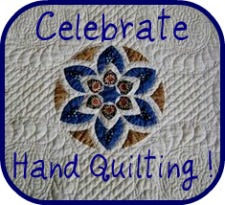 Since you enjoy hand work so much, are you going to hand quilt it? It’s certainly going to be an heirloom. Thanks for participating, sharing your amazing creativity, your antique butter dish, and making me drool. I hope to see you in more hops soon. Hexies are so nice for travel. Your hexies are so pretty. Thanks for sharing. Such pretty hexagons. The fabric is beautiful. Perfect hand project for vacation! Beautiful! I love the colors. You will have a gorgeous quilt when you are done. Love your hexie WIP. I love hand work too. You’re right it can be so relaxing. Your feline helper(s) is so sweet-I have 3 furry assistants that I’d swear if they had an opposable thumb, my little black rescue Bombay would be sewing! Thanks for sharing. What a lovely group of blocks, like flowers floating on a lush lawn. Your colors are so sweet and I can see why you are enjoying the handwork. Thanks for sharing everything today! This will be sew beautiful! And your view!!! Years from now I bet when you sit under the quilt you will be able to close your eyes and see that amazing view!!! Beautiful!!!! The colors are just so complimentary! Great job! Beautiful work and those colors are so pretty. I think you seem to be zooming along. OMG! My favorite colors! It will be a gorgeous quilt when it is done. Great job! It’s beautiful already! Love the fabric! Great job on the start of your hexi quilt! Love your color choices. Love the colors of your hexies. The flower hexies look like cute little bowls when you have them all stacked up like that. The quilt top look fabulous and will be even better once it’s all finished. Simply breathtaking- I am in love with the fabrics and your flowers! Spectacular hand work! It is turning out beautiful Nita ! How big do you think you’ll make it ? Very nice. That will be beautiful when you finish it. This is so beautiful and the fabrics are perfect for the flowers! Those hexies are just beautiful and will make an amazing quilt! Looks good so far. Love how the pieces fit in your container. The fabrics are so lovely setting off the flower petals from the jelly roll. You are definitely making your own spin on a Nita heritage quilt. Way to go! Love, love, love how it is coming along!!! Can’t wait to see it finished!! Wow, gorgeous! I love the fabric combination and your hand work is awesome! Simply gorgeous – you’re going to have an heirloom when it’s done. Thanks for sharing. Stunning! It is going to be a gorgeous quilt! I loved seeing the cat enjoying your hexies too. All is the way it is supposed to be! Well done you! Beautiful!! you are doing a fantastic job on your hexies….the green path is making this quilt stand out so nicely…I just love it….and it makes me want to do more myself. Nita, I love how it’s coming together. Absolutely gorgeous. It’s going to be so stunning when it’s done. Would it be cheating if I did one of your flowers? I think I’d just love to sit with you and make one sometime this fall.